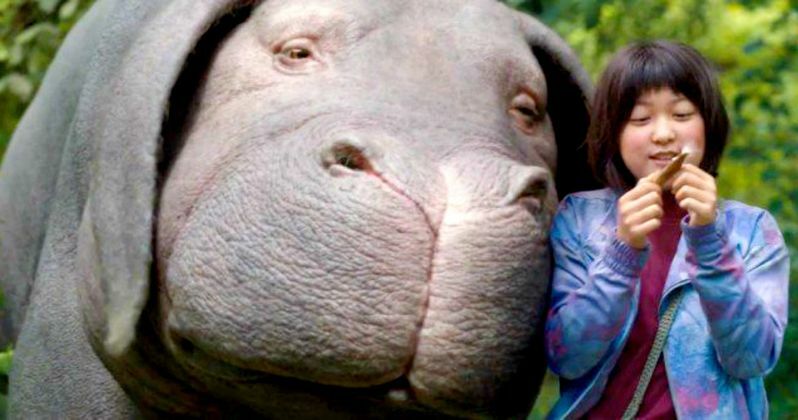 Yesterday, Netflix debuted the new Okja trailer, which offered our first look at the massive pig creature that lies at the heart of this bizarre new movie. The trailer was released just before the film's world premiere screening half-way across the world at the Cannes Film Festival, before the film debuts on the Netflix streaming service June 28. While the early reviews that have come in from the screening were quite positive, the premiere was marred with some technical difficulties, which resulted in the film, and Netflix itself, being booed by several audience members. Fox News reports that the booing didn't actually start because of the glitch, but rather because of a different protest. Several French distributors and press members protested that both Bong Joon-ho's Okja and Noah Baumbach's The Meyerowitz Stories, Netflix's other movie at the festival, shouldn't be allowed to be in competition for the festival's coveted Palm D'Or award, and when the Netflix logo was shown before the Okja premiere, several members of the international press booed. But that was only the start of the trouble. The projection was framed in the wrong aspect ratio, which threw off the framing and caused the packed theater to hiss and clap until the projection was fixed. After a 10 minute wait to correct the projection, the film was restarted, and when the Netflix logo appeared again, even more booing occurred. The Cannes Film Festival issued a statement about the incident, which was merely a technical error, and not some sort of "anti-Netflix sabotage" as some have suggested. Here's the festival's brief statement below. "This incident was entirely the responsibility of the festival's technical service, which offers its apologies to the director and his team, to the producers and the audience." Going into the festival, both Okja and The Meyerowitz Stories were being released at the festival in competition for the Palm D'Or prize, but that all changed earlier this week. On Wednesday, Cannes jury president Pedro Almodovar appeared to indicate that both films will not be in competition for the Palm D'Or, stating that films which aren't played in a theater shouldn't be eligible to win this award. The protests also lead to Cannes enacting a new rule, starting next year, that bans streaming-only films from the festival. Director Bong Joon-ho took the whole incident in stride, stating that he was happy fans got to see the opening of his film twice. "What happened this morning, I'm quite happy with it because it forces you people to watch the opening sequence twice. There is so (much) information and story elements there. So very educational. I love it." The protest of Okja isn't exactly warranted either, since the film will get a theatrical release in some markets, running concurrent with the Netflix premiere on June 28. Tilda Swinton, who plays Lucy Mirando, an image-obsessed CEO who steals the title creature from its young caretaker (An Seo Hyun), said that there should be room at Cannes for all films, theatrical and streaming-only alike. Here's what the actress, who is also a former Cannes jury member, had to say below. "Let's be honest, there are thousands of films that are screened in the Cannes Film Festival that people don't see in the cinema, the most beautiful, the most esoteric films that people never see in the cinema. Netflix has given Bong Joon-ho the chance to make his absolutely liberated vision a reality, and for that I'm so grateful." The actress added that they didn't come to the Cannes Film Festival for "prizes," but to simply show the film to festival audiences. Bong Joon-ho added that Pedro Almodovar "can say anything" about his film and he'll be fine with it, and that he's just happy the filmmaker will be watching his movie. Hopefully we'll have more from Okja as we get closer to its premiere June 28 on the Netflix streaming service.